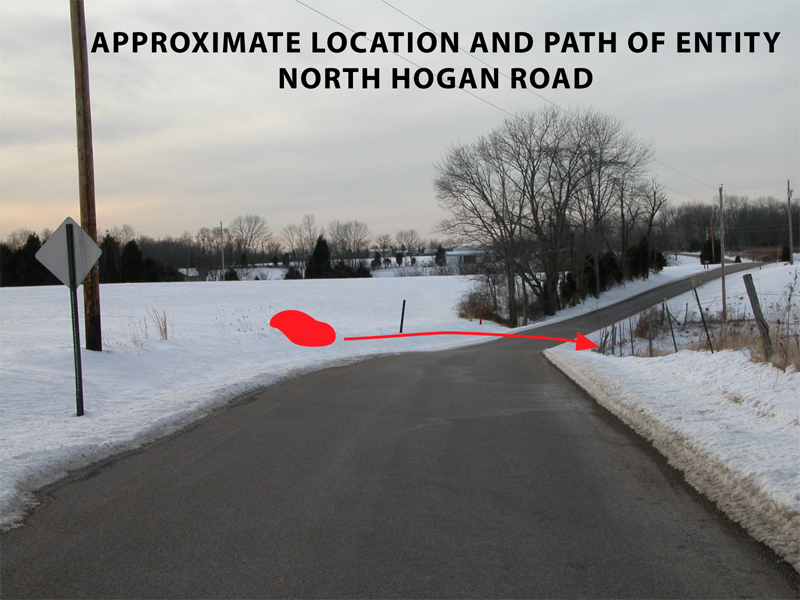 DATE: Saturday, January 24 – 7:30 p.m.
A 17-year old motorist traveling almost 10-miles north of Aurora, Indiana around 7:30 p.m. at night on Saturday,January 24, claims to have encountered an unusual ‘figure’ in the roadway. The story was first related second-hand by his uncle, Jerry Schedel (name used with permission), to Bob Leibold of Natural Light Productions, producer of the Cincinnati-based cable television program “UFO Update: LIVE!” on Sunday, January 25. After arrangements were made, I spoke directly with the primary claimant by telephone on two occasions after 8:30 p.m. Monday evening, January 26, confirming the story earlier given and asking additional questions to the witness. The witness lives in Manchester,Indiana and is a senior at South Dearborn High School. He has 1-sister currently in College and lives at home with his mother and father. His name will not be used in this report. While driving his black Chevrolet Cavalier,a 1999 2-door model southbound along North Hogan Road, near Manchester,Indiana, a “figure” was spotted in the headlights of the automobile a sit was crouched down near a puddle of water. 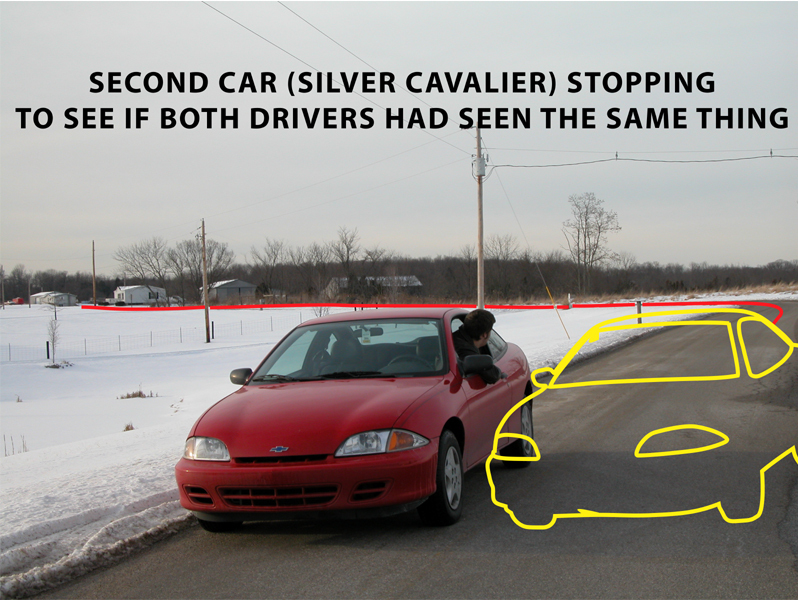 From the driver’s perspective,the “figure” was spotted out the windshield on the right of the car. “I passed it and looked in rear view mirror, then it was standing,” he said. 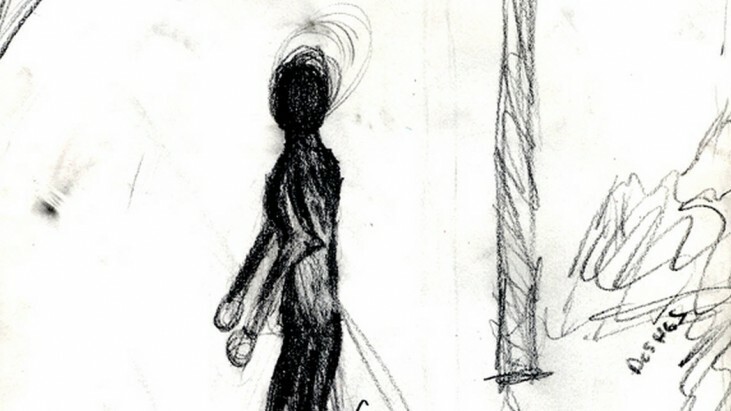 After passing the frail-looking figure,the driver looked into his rear view mirror and again observed – illuminated by the tail lights of his car – what he described as a tall, abnormal figure that moved strangely with pointed joints that “buckled out.” He estimated the figure stood around 6 feet, seven inches. The driver said he was able to ascertain the figure, alleged to be dark gray or black and ‘pencil thin,’ stand up and take several steps toward the woods along the roadside. 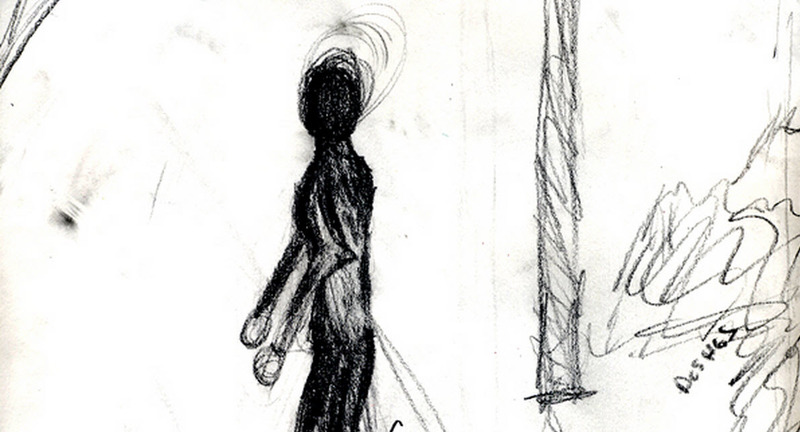 The ‘figure’definitely walked on two legs and was thought, somehow, to be a male -although no clothing was noted. No face or eyes could be seen, but the witness had the impression that the ‘figure’ was looking straight at him. The ‘figure’ was immediately thought to be something out of the ordinary, not a human being. The duration of the sighting was ‘hurried’ and possibly within the 3 to 4 second range. The driver continued on for a small distance after passing the figure and finally put on his brakes, coming to a stop at an estimated 2-minute “walking distance” on the road from the location of the sighting. 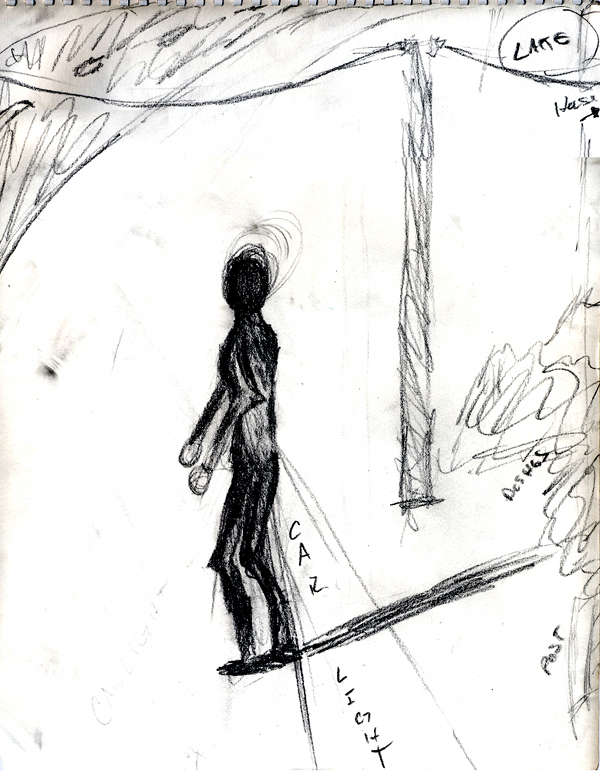 He looked back to further observe the entity.At that point, a second car came into view and approached from the opposite direction, passed and then reached the spot on the road where the ‘figure’was thought to be. 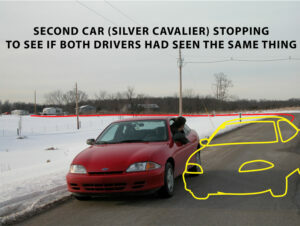 The 17-year old motorist reportedly watched closely and observed the second car undertake what he thought to be an evasive maneuver near the vicinity of where he thought the figure would be situated,then the car turned around at that spot and shortly pulled up behind him, somewhat in the grass. 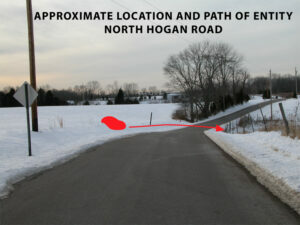 The elderly couple were reportedly “spooked”but offered to follow the first witness the remainder of the trip down North Hogan Road, clearly in the opposite direction of their intended destination route. It was thought that the elderly couple observed this same ‘figure’ on the opposite side of the road, and possibly had observed it more closely. 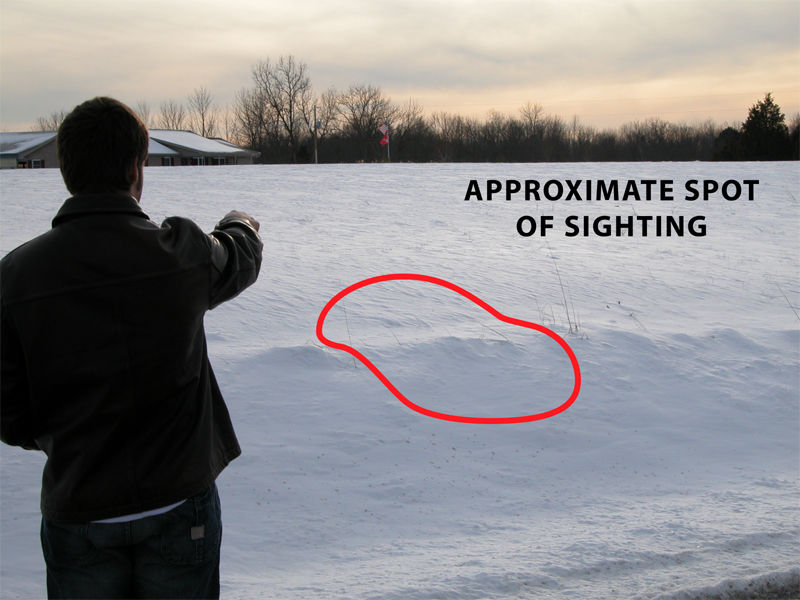 When asked by his uncle if there could be any alternative explanation for this’figure,’ the witness said that there was a chance it could have been an”improperly dressed elderly person,” but still described the object as a “dark, shadowy figure” and “super anorexic” that could have been wandering naked and lost (temperatures in the 20s) in the area without a coat. If so, the witness reportedly said, he would have ‘felt badly’ for the person. The uncle, Jerry Schedel, was contacted within an hour of the sighting and traveled to the area with his wife some 90-minutes later and did not see anything. There is a house and pond nearby,almost 1/4 mile from the area of the sighting. The uncle said his nephew knows the exact location and can identify the spot, but would not agree to return to the area until daylight. He said that he did travel down North Hogan road this afternoon during daylight, slowing down to survey the location of the incident but saw nothing out of the ordinary and the ground was also covered with around 4-inches of snow. The witness sounds very sincere and cognizant. He answered my questions patiently and offered continued assistance in the investigation process, such as drawing a picture of the ‘figure’and returning to the location for inspection of the area.